Serbian Parliament Building, originally uploaded by bill kralovec. I took this photo on last Friday’s field trip to the ivo Andric museum. Both the Parliament building and Andric’s former apartment on on Pioneer’s Park. It was a beautiful sunny morning. This week has been grey and rainy. Temperatures are in the 40’s and 30’s (F) and the sun is supposed to be back on Friday. It looks like temperatures will dip below freezing next week and I am hoping for snow. 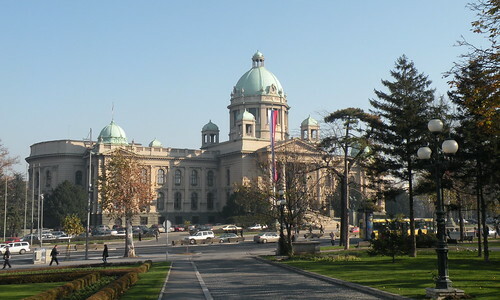 Serbia’s parliament has one house called the National Assembly consisting of 250 members. That is one representative for every 26,000 Serbian citizens. I don’t know how that compares to other countries, but it seems to be a bit of overkill. The school is planning on having some of our older students serve internships in the parliament next semester through an international NGO. I am looking forward to that. The public can visit the parliament on the last Saturday of each month. I would like to do that with the boys.